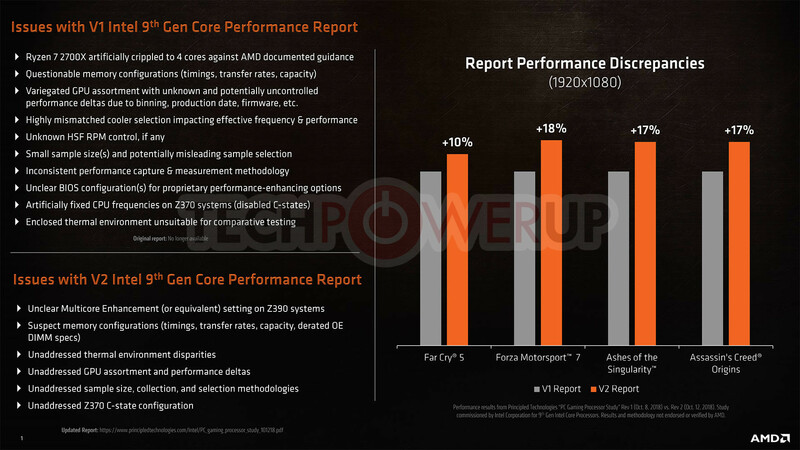 AMD gave its first major reaction to the Principled Technologies (PT) controversy, in which it came out strongly against the questionable methods PT employed, in its performance comparison between the Core i9-9900K and AMD Ryzen 7 2700X, in addition to certain other Ryzen Threadripper series products. In its response, AMD made its official position on controversy clear - it is not happy with PT. AMD prepared a long list of flaws with PT's original testing, and the areas where it did not correct the mistakes in its second testing. The company also put out a list of its own "best practices" for comparative benchmarking, which prescribes "sanitizing the operating system," "sanitizing the platform" for stock vs. overclocked testing, "sanitizing the data," and to not create a vast disconnect between the test environment and the real-world. Their orginal methodologies were so flawed it really begs the question how they've surivived this long as a company. Such basic inept errors were made, it would surely call in to question all their previous work over the years. If I were a client of theirs I'd certainly be looking elsewhere. It's beyond farce. I'd like to think AMD's PR team is intelligent enough not to make themselves hypocrites. Wow ... Spectre, cheating, and running hot like a new i9 9900K even though Intel gave them solder! "Enclosed thermal environment unsuitable for comparative testing" - What the systems had cases as opposed to open rigs? IMO that's a plus as it's mimics real world use..
AMD should have people doing a slew of tests live with specs all posted on Youtube. Obvious they can't trust PT for their unprofessional style. PT was used to give Intel an out. It’s not false advertising, as an independent company did the testing. 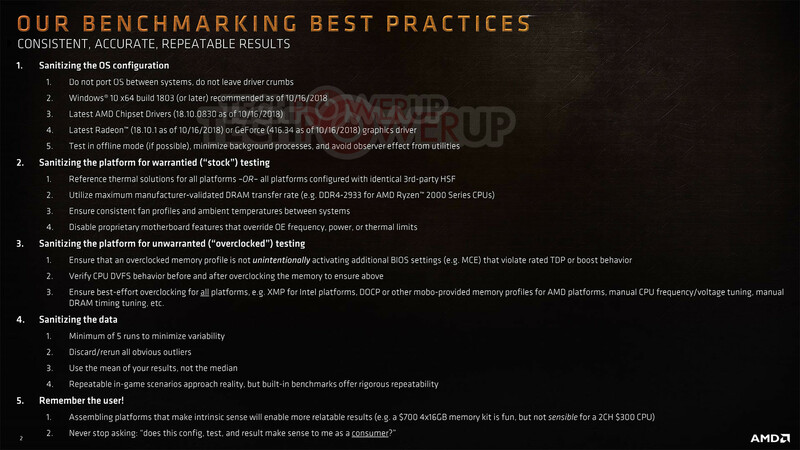 Everyone will quickly forget the company “Principled Technologies,” just like they did with CTS-Lab, a company that still hasn’t published the documents on the AMD flaws it found, and it has done no other research since. I think they're referring more to the specific case PT was using. The case they were using has very little direct airflow, and they were using the stock downdraft cooler on the AMD benches. This created a scenario where the CPU was not being properly cooled for the setup. I mean amd isn't exactly the king of fair in pr events on their own side, but this webpages delivery was a trashcan fire. The thing with PT is like you said, they were hired by Intel. My curiosity on the matter is if PT's original testing was carried out as Intel asked, purposefully giving them the numbers they wanted, and then the follow up was OK'd by Intel to try and stop the bleeding. I know Steve from Gamer's Nexus interviewed one of the founders of PT, and according to him they tested it how they wanted and how they thought was appropriate, but if a big corporation is paying you big money for something, you're not going to throw said corporation under the bus. Still tho "Gaming Mode" .. seriously..you call it game mode then get pissed when they use it for games? Why even have it then? Well, $$$ talks louder. PT will surely get banned by AMD for sure, given the high fees $$$ paid by Intel. "sanitizing the operating system," "sanitizing the platform" for stock vs. overclocked testing, "sanitizing the data,"
Game Mode is for Threadripper. Why AMD gave it to Ryzen, who knows. ITs because the game mode is meant for legacy titles. Some games won't even run if more than 4 cores are present or have issues. Supreme Commander comes to mind. They don't need PT for that: remember Polaris launch, where they claimed 2 cards surpassed the 1080 in AotS @ a much lower cost? Why get upset anyway? This duopoly can't fail whatever the other party does. While Lyle trying to blow the dust off the running 2700x bench using a heat gun during benchmarking session. You mean Raja who said it... and you know how that turned out? Intel hired Raja with offer he can't refuse. Says a lot about Intel eh. Apparently, Raja was deprived of 2 / 3 of the engineers assigned to work on Vega early during Vega's development, which were re-assigned to work with one of CPU projects (dunno which Zen version), or so i've read: can't seem to find where i read that, atm. This is the reason Vega took way way longer to be introduced VS the planned time and that may, quite possibly, have a direct impact in it's current performance. Those benchmarks were obviously flawed and one can't help but wonder if it was done on purpose considering the circumstances but.....why? Intel was going to win. While Ryzen has taken AMD leaps and bounds it still is not as fast as Intel in most gaming situations...we know this. They know this...Intel knows this...So why try to make it seem like Intel is even further ahead then they are when you know the backlash is going to beat you up when the embargo is over? It makes no sense unless PT is truly that incompetent. As the saying goes ; Never assume malice when incompetence could be the motive.